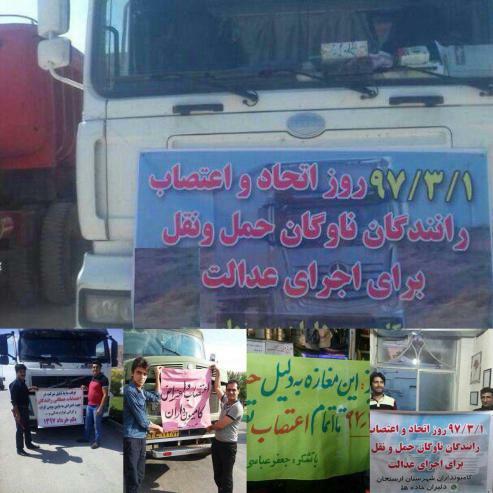 Truck drivers all around Iran are staging a nationwide strike presently following a formal announcement. They called on all truck drivers in all of the cities to join the strike, as of today. They have announced that this strike will continue till their demands are granted. The Iranian authorities quickly tried to scatter the drivers and cause a division between them by announcing that transportation fares have exceeded by 17%. This scheme occurred in cities such as Isfahan and Bandar Anzali, in Gilan Province. But they didn’t succeed in seizing the truck driver’s strikes. Officials in Bandar Abbas tried to talk the drivers into giving up on the strike but none of them were willing to listen. The Transportation Organization passed out an announcement to all of the cities mentioning a 20% additional load fare and that truck drivers can start their loadings. But drivers are still not satisfied and want the load fare to rise 50%. Truck drivers in Romania have also joined the strike by not loading their trucks today. Western Azerbaijan, Eastern Azerbaijan, Isfahan, Ilam, Khorasan Razavi, North Khorasan, Khuzestan, Yazd, Hamedan, Hormozgan, Markazi, Mazandaran, Gilan, Kurdistan, Kerman, Qazvin, Fars, Sistan Baluchestan, and Zanjan.